Android WebView is a View that allows you to display website, static HTML data, and your custom web page. Using WebView you can able to convert your web page into android application. Here I describe how to load HTML Data on android WebView. To load HTML string on your android WebView, first you have to add <WebView> element in your layout file. To load HTML data in your android WebView just call loadData(), here is final code of MainActivity.java file. 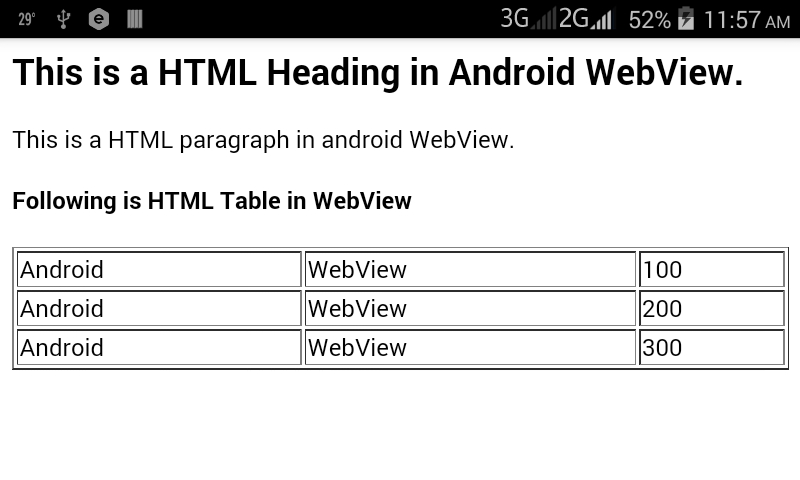 That’s it, now run your Load HTML Data on Android WebView application, your app is look like below screenshot. Download complete Load HTML Data/String on Android WebView Application example project source code from GitHub.